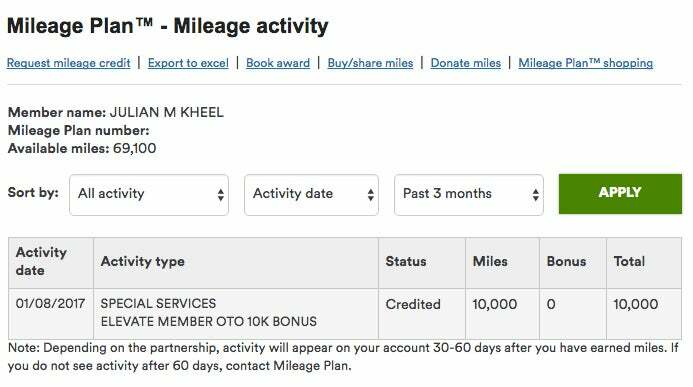 We understand that many Mileage Plan members have questions about a surprise 10,000 mile gift that started appearing in some accounts last night, and we wanted to help put some of the mystery to rest. We can’t wait to show members of both programs what more to love looks like with Alaska Mileage Plan, and decided to kick things off with a 10,000 mile bonus award to thank our guests who have been loyal members of both Elevate and Mileage Plan. The gift process is expected to be completed over the course of next couple of days, and eligible members — which includes guests who were active in both Elevate and Mileage Plan as of December 5, 2016 — should look for an email from Mileage Plan later this week. Elevate members who don’t have a Mileage Plan account will be invited to activate one, along with details about their own special welcome offer, how to convert points, and status matching. For now, please sit tight, and we’ll be sharing more information about what members have to look forward to in the next couple of days. Not everyone has received these miles so far, and there’s been a lot of speculation as to who will get them and why. We’ve reached out to the media relations folks at Alaska to ask if they would share some details, but in the meantime we’ve also spoken to the frontline agents at Alaska Mileage Plan and have been monitoring reports across the points and miles community. In our conversation with two different Alaska agents, we were told that all current Alaska Mileage Plan members who had an active Virgin America Elevate account as of December 5, 2016 will eventually get these 10,000 bonus miles even if they haven’t received them already. One of the agents said that an email was supposed to go out regarding this bonus before the miles were awarded, but it may have been delayed due to the fact that Alaska is dealing with weather issues in the Northwest and didn’t want to overload its phone lines with extra callers. To be fair, these are unconfirmed reports at this juncture, so we are still waiting for an official statement from the airline on this question. But if you did have an active Elevate account on December 5 and haven’t seen any bonus Alaska miles yet, sit tight and hold off on calling the airline for a little while until we can get some confirmation on the situation. Now, if you were a Virgin Elevate member as of December 5 but are not currently an Alaska Mileage Plan member, there’s also another separate targeted Alaska offer going around today. 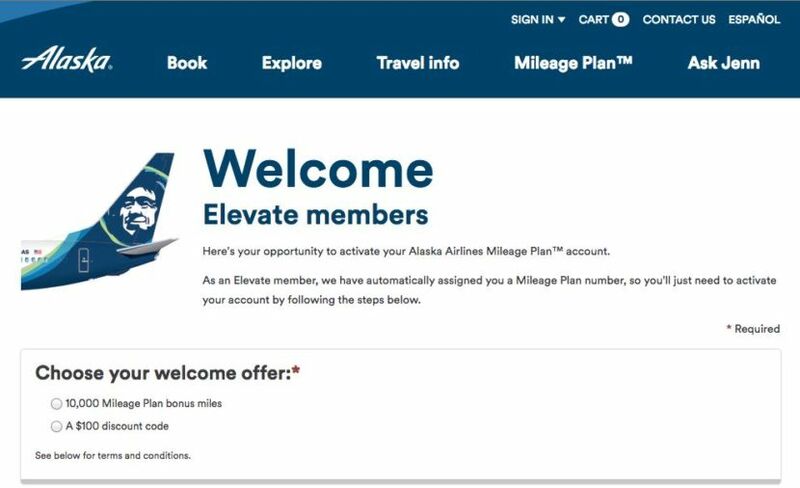 Alaska may have automatically created a new Mileage Plan account for you and asked you to activate it while offering a welcome bonus for doing so. The welcome bonus is your choice of either 10,000 bonus miles or a $100 discount code. The terms and conditions for this offer specify that it’s targeted, and the sign-up screen requires that you have your new Mileage Plan account number from the welcome email, so if you didn’t get the email you probably can’t sign up for it on your own. But again, given the weather situation at Alaska today and the fact that it appears to be behind on emails, you may want to just hang on and see how things unfold before contacting the airline.